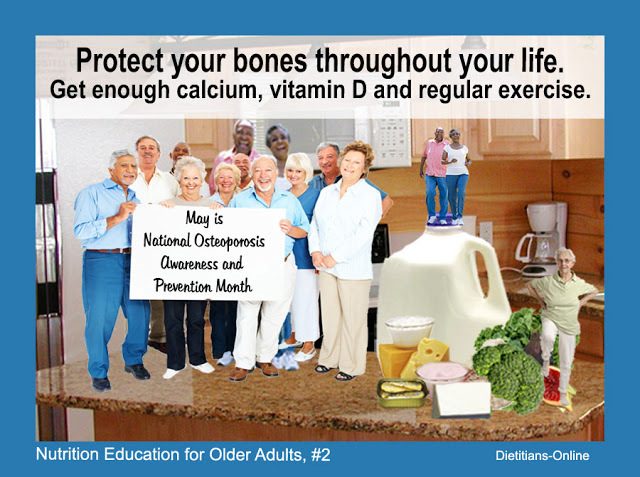 May is National Osteoporosis Awareness and Prevention Month. The National Osteoporosis Foundation (NOF) is the leading consumer and community-focused health organization dedicated to the prevention of osteoporosis and broken bones, the promotion of strong bones for life and the reduction of human suffering. Osteoporosis is visible in the lives of the millions of sufferers worldwide. Researchers today know a lot about how you can protect your bones throughout your life. Getting enough calcium, vitamin D and regular exercise are important for your bones.